Our best selling gift box is the perfect gift for anyone on your list! 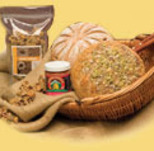 Includes one loaf of our Honey Whole Wheat, one loaf of Cranberry Orange Bread, a loaf of either Pumpkin Chocolate Chip Batter Bread or Ginger Bread, a package of biscotti and a bag of granola. Say thank you in a big way! 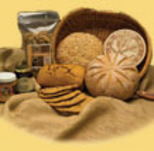 A stunning arrangement featuring a loaf of Honey Whole Wheat, a loaf of Cranberry Orange Bread, a loaf of either Ginger Bread or Pumpkin Chocolate Chip Batter Bread, four giant cookies, one pound of Granola, a package of Reindeer Crunch Trail Mix and a package of biscotti. 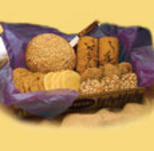 Our most popular combination includes a loaf of Honey Whole Wheat, a tea cake of the day and four giant cookies. 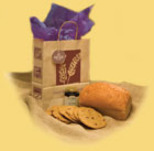 Substitute the honey whole wheat with one of ourdelicious specialty breads for an additional $2.50! Send your greetings to the entire staff, or share with the whole family! Includes a loaf of our Pumpkin Chocolate Chip Batter Bread, one loaf of Ginger bread, a loaf of Cinnamon Chip Bread, four giant cookies, four assorted muffins and four assorted scones.